One of the great things about Stone Grindz is the chance for me to catch up on new creations or specials (even though I suppose I still haven't tried all of their more standard chocolates . . . but there's time for that in the long term, right?). 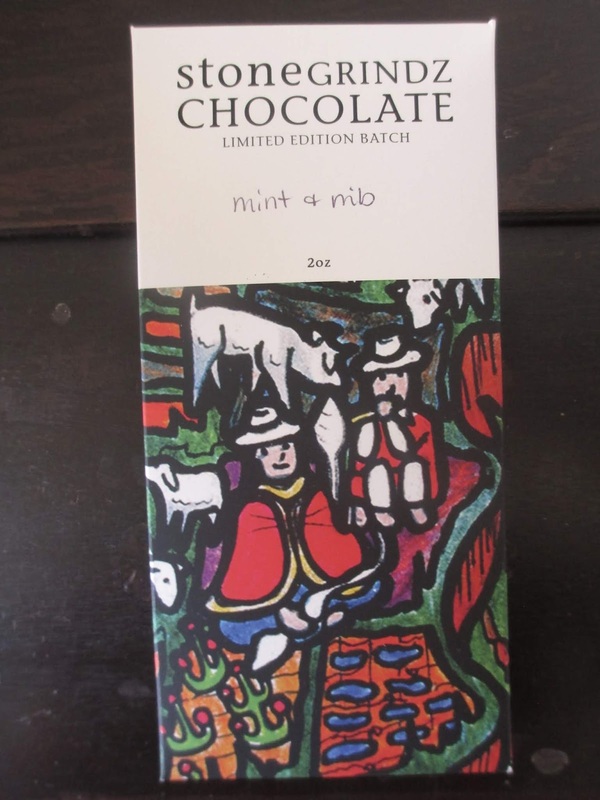 So the one I have here today is the Mint & Nib bar. Mint chocolate I have had and chocolate with cocoa nibs in it I have had--but mint and nibs together I don't think I have had before. 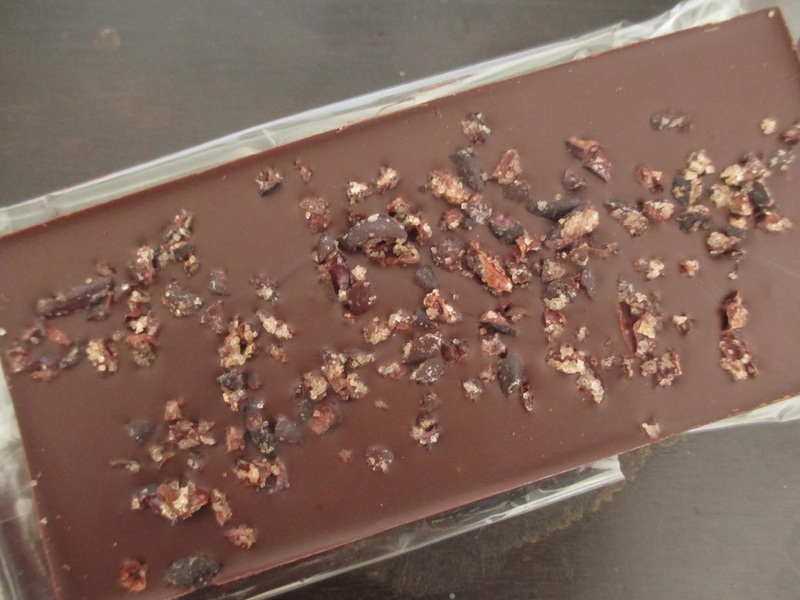 Opening up this package reveals sugary nibs on the back of the bar in chocolate bark style. They're like little gems on the shiny, smooth surface of the chocolate. 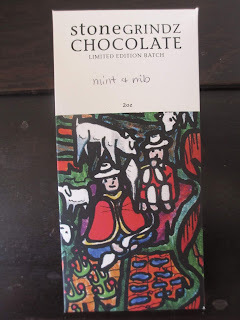 Immediately I get the aroma of the mint in what I have been, in my recent comments about mint chocolate, calling more of the mint oil variety. Obviously, the nibs invite you to crunch the chocolate. And nibs do have such a great, unique crunch. Naturally, there are more of them towards the middle of the chocolate and less towards the edges, so the corners don't necessarily have any nibs at all. The effect of the nibs, I realize, is the mint crunch effect that you get from cookies and candy bars--just brought out with a different type of ingredients. Crunch adds casualness while the use of nibs keeps things classy. So casual classy--would that make this chocolate chic? The mint is mint. It didn't particularly wow me, but it stood its ground. 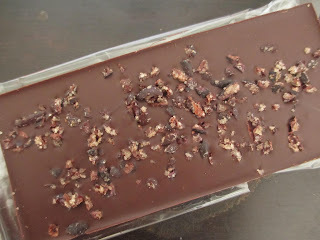 The flavor of the chocolate, too, makes for a great flavor base; it's smooth in flavor with just enough presence to create quality while also not detracting from the main effect of the mint and nibs. Interestingly, the first time I tried this chocolate was at my usual time for chocolate tasting (mid morning), but I liked it more when I tried it again another day around evening. Those are both supposed to be the best times for tasting, but I suppose it makes sense that mint chocolate would taste nicer in the evening than the morning. After dinner mints and chocolate mint desserts all. So maybe I ought to keep that in mind as I go forward with more mint chocolates in the future.